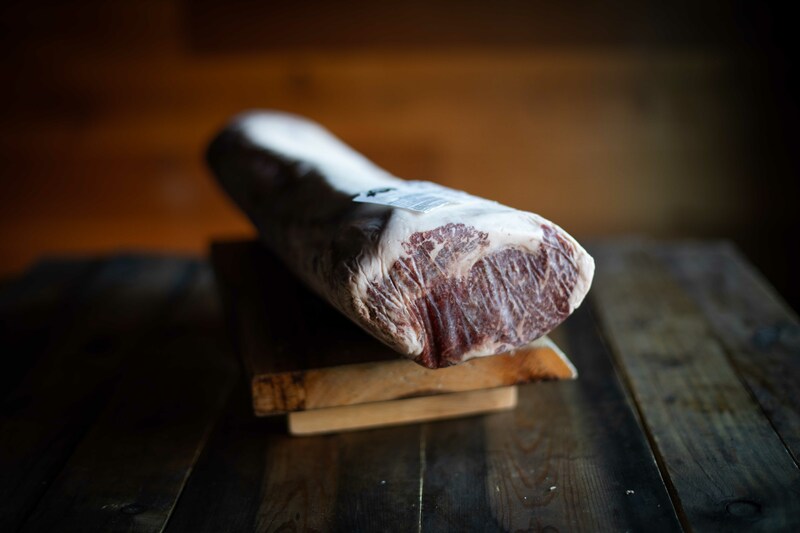 On this week’s blog we’re talking about Wagyu beef. This incredible meat is often heard of, but many people don’t actually know much about it. Here our Executive Chef Fran Martinez tells us more and shares a recipe with us too. We’ve been working with a close supplier of ours on a project in Australia, and we’re finally able to bring this fantastic meat to Fazenda. Our supplier has been raising a number of cattle to produce Wagyu beef exclusively for us for over three years! Wagyu will be available for a limited period of time as our Butcher’s Choice in all of our restaurants, Fazendeiros. It’ll be available on our evening menu, and also in a series of new Tasting Menus that will be travelling around all of our restaurants throughout 2019. More on that soon on our blog! Wagyu translates as ‘Japanese beef’, so it’s literally named after its country of origin. It’s considered by many as the best beef in the world, partly due to its rigorous, almost fanatical production monitoring. The ‘crème de la crème’ of Wagyu are given ‘origin destinations’, with the most famous being Kobe, which can fetch more than £500 a kilo in Japan. Wagyu comes from very specific breeds of cows. They’re genetically bred to produce a highly-marbled meat that tastes completely unique and special. Around 2010, a ban on Japanese beef was put in place, so countries in Europe and other areas of the world were not allowed to produce it. This ban was lifted in 2015, meaning Wagyu is now produced in several locations once again. The United Kingdom, United States and Australia became notable for their high-quality Wagyu after the lift of this ban. It was the perfect opportunity for this previously rare cut to become more accessible all around the world. Fran wanted to show us how we can make a steak tartare at home. It’s one of the intricate dishes that will be on our Tasting Menu, and we think you might love it, Fazendeiros. Although Fran has used Wagyu for this recipe, any good cut of beef such as tenderloin or sirloin can be used too. It’s important for the cut to be very high quality and lean for this particular dish. Many people are unsure about steak tartare due to the meat being raw, but by following the correct tips when creating this dish, the risks are actually very low. 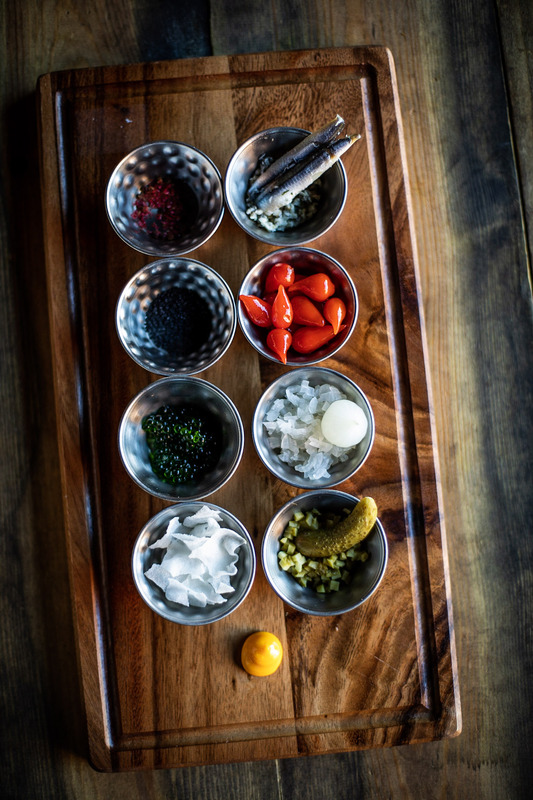 With all these ingredients we can create a classic tartare easily from home. On our Tasting Menu, Fran has gone even further and used these ingredients in a few more exotic ways. 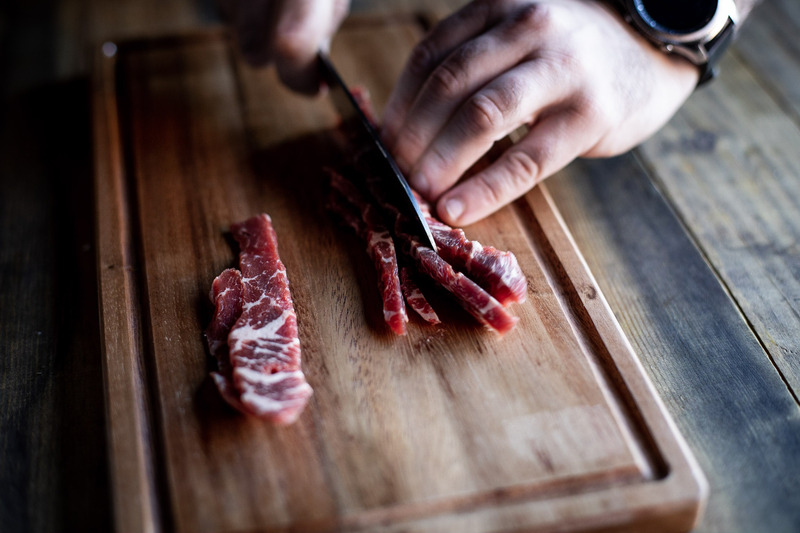 It’s important when handling raw meat that you’re careful with two main factors. Work surfaces need to be very clean, and the temperature of the meat needs to be kept below 8°C throughout the whole process. – A useful tip to aid in cutting the meat is to place it in the freezer for about 20 minutes, until it is firm but not frozen. This will allow our blade to cut through it much easier, but will also ensure it stays cool, even when it is diced. While the meat is in the freezer, we can finely chop the gherkins, chives, onions and anchovies in preparation. Before preparing the tartare, we need to make sure that we wash our chopping board, knife and hands thoroughly. 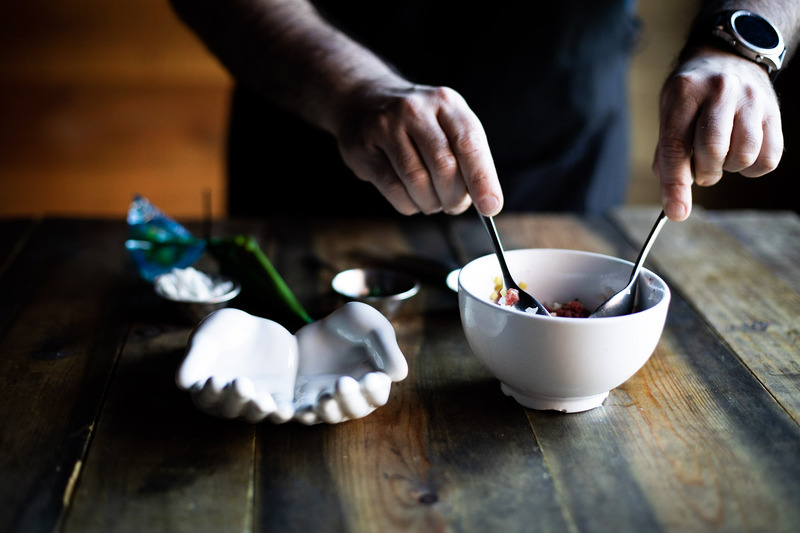 – Next, take two bowls and fill one with ice, and place the other one on top. 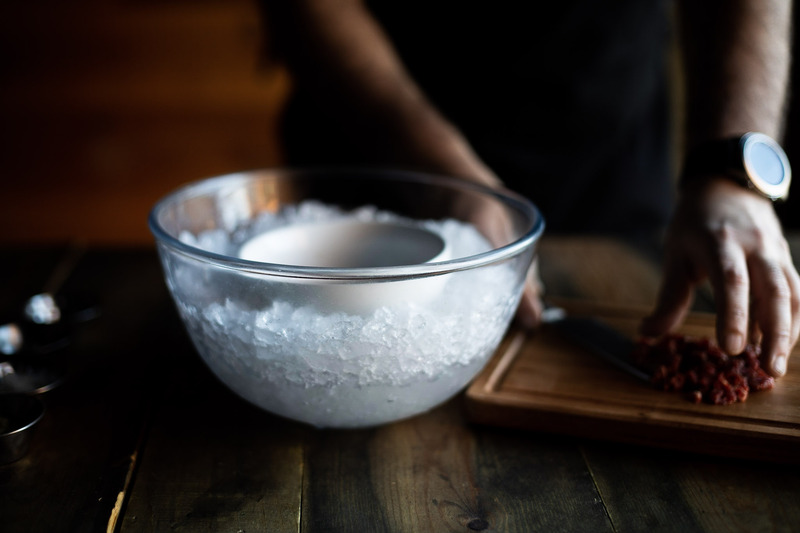 Our steak can be placed into this bowl once it’s cut; the ice will keep it nice and cold. – Then we can take our steak out of the freezer, and dice it into equal-sized squares, so that they can all be marinaded equally. Place all the meat in the bowl mentioned above. – Once the steak is diced and in the bowl, we can then add the previously chopped ingredients along with our Maldon salt, cracked pink pepper and olive oil into the bowl and mix them thoroughly. It’s now ready to be served! It’s up to you on how you’d like to serve it. Fran suggests doing so with bread sticks, but he also wanted to show us the classic way to serve this dish – just as we will do on our Tasting Menu. Fran serves this dish using the classic recipe above, but also puts a Fazenda twist on the recipe. The dish is garnished with rice paper crisps and a lemon and mustard mayonnaise (made using the lemon juice, English mustard and mayonnaise from the ingredients). Instead of using Tabasco sauce, he uses a home-made spicy sauce made from the biquinho peppers. Finally, special dill spheres are added to complete this dish’s unique look. 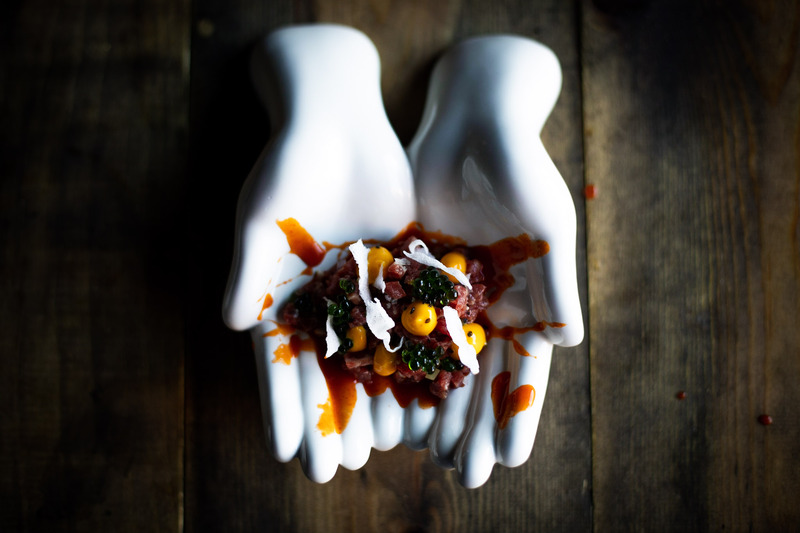 Fran has named this dish ‘The Butcher’s Hands‘ for our Tasting Menu, as he believes that we should all trust and support our local butchers. What do you think about this recipe, Fazendeiros? We’d love to hear from you if you give it a try on our Facebook, Instagram and Twitter, and if you have any questions for Fran, post them in a comment below!